Embers of Eden are a Plymouth based female fronted hard rock band formed by two ex-members of Carnival of Crows:- Alex Dumbiotis (Vocals ,Guitar) and Oli White (Guitar); they are joined by Matt Avery (bass) and Chris Harding(drums). The set kicked off with "Let Us Burn", lead singer, Alex's voice sounding stronger than ever with Oli's intricate guitar work served over a beefy bass line provide by Matt. 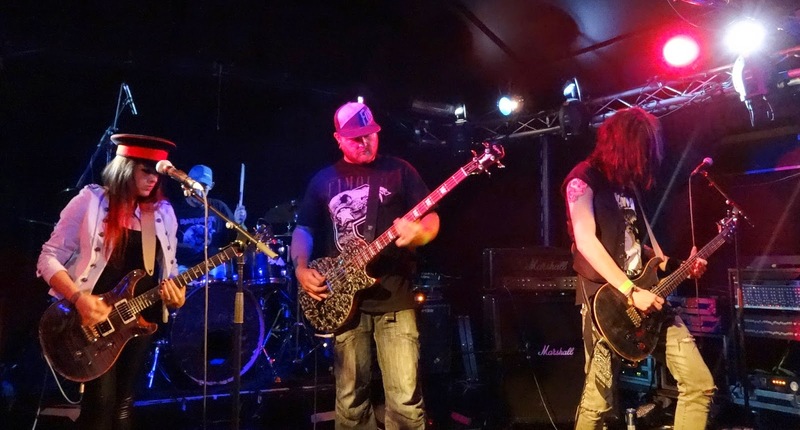 The band have a unique style which borrows from bands such as Sevendust, Halestorm, Bullet for My Valentine and Avenged Sevenfold to create a sound of their own. For the second song of the set "Pull Me Under", Alex had picked up her guitar providing a bed of heavy chugging riffs to counterpoint Oli's complex guitar parts.The song featured the catchiest chorus of the set; "If my time runs out don't you be the one to pull me under." which is guaranteed to go round your head for days. The award for most complex guitar work goes to "Bleed" with Oli's crazy mesmerising fret hopping antics leading to an epic breakdown before settling in to a groove with all band members locked in together. Special mention goes to drummer Chris for some quick fire machine gun drumming propelling the song. The set ended on "Decay" starting with a slow atmospheric introduction before seguing into a full on aural assault, the band bludgeoning the listener with pounding drums and massive riffs right to the end. The shouts of "one more song" rang out, only to be denied by a less than rock and roll punctuality obsessed sound man. Embers of Eden came, played and conquered the Hub.